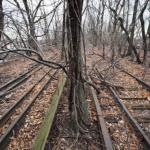 A new feasibility study, which is set to be released today by the Trust for Public Land, maps out the plan for the QueensWay–the High Line-esque linear park and cultural greenway proposed for a 3.5-mile stretch of abandoned railway in central Queens. 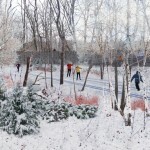 The study points to the likely $120 million price tag and the park’s benefit to the local economy. 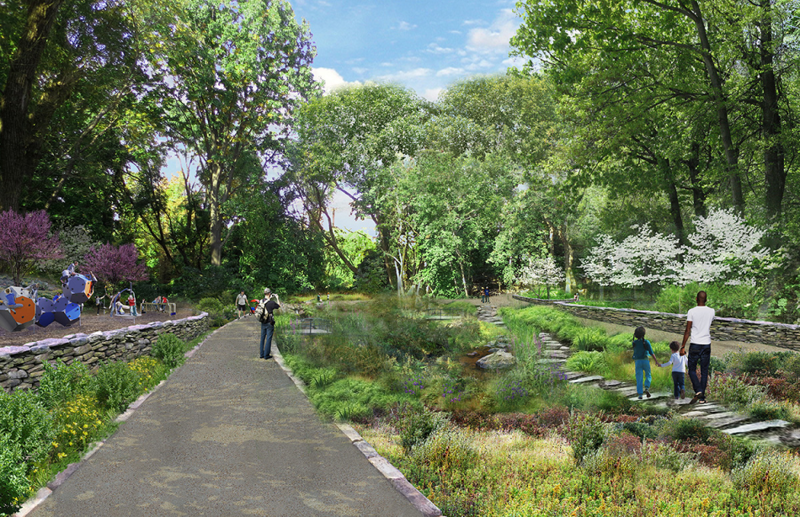 Through new renderings it also shows access points, exercise stations, food concessions, outdoor nature classrooms, bike paths, and an “adventure park,” among other amenities. 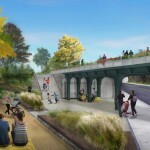 The concept for the QueensWay came from a group of local activists known as Friends of the QueensWay, and the new feasibility study, which was funded through a state grant, took into account community input. 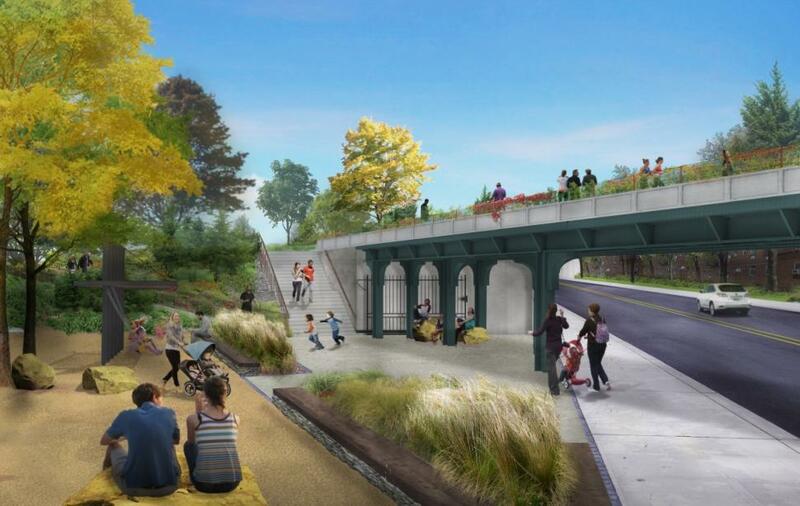 While the cost was assessed at $120 million for the 3.5-mile park, the 1.45-mile High Line, in comparison, cost $152 million for the first two sections and $35 million for the third section, according to DNAinfo. To date, $1.5 million has been raised towards the QueensWay’s overall goal. The railway, the now-defunct Long Island Rail Road Rockaway Beach Branch, extends through Rego Park, Forest Hills, Woodhaven, Richmond Hill, and Ozone Park. By incorporating several new access points, local businesses and institutions would see increased economical opportunity. Economists estimate that the project would attract an additional 1 million visitors, each of whom would spend $7 to $21 at local businesses. 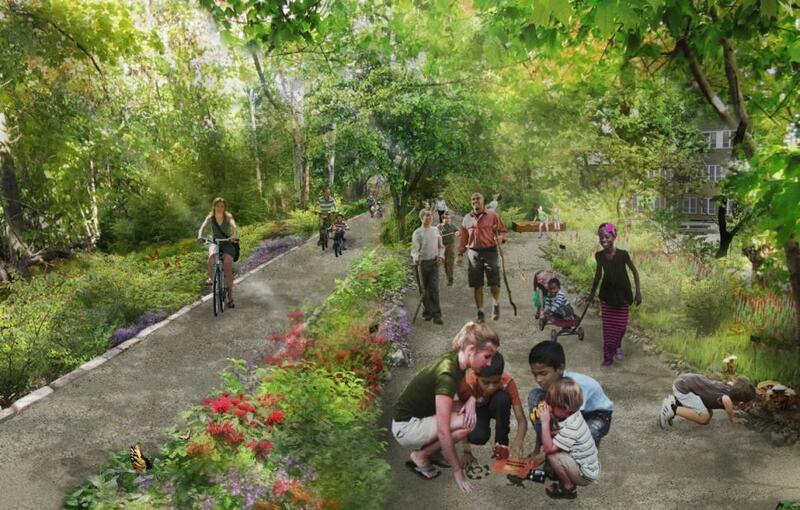 Plus, more than 320,000 people live within a one-mile stretch of the railway, and the QueensWay would provide them with not only parkland, but a safer place to walk and bike. 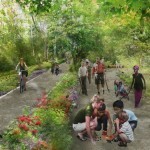 The firms WXY Studio Architecture + Urban Design and dlandstudio have created the conceptual designs for the QueensWay. 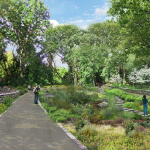 In addition to fun possible inclusions like a zip-line and giant slide, the park will boast green infrastructure that will reduce the risk of flooding and a shrubbery buffer zone to provide privacy for local residents. 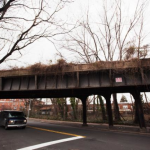 Though the property is currently owned by the city, the de Blasio administration has yet to weigh in on the proposal.